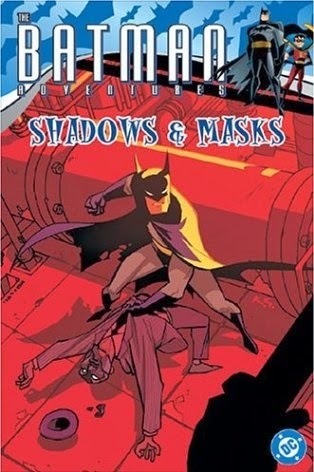 Great little digest edition that combines issues 5-9 of "Batman Adventures" based on the TV Cartoon. Great cast of characters, edgy and dark but not overly, leaving room for fun and humour. Harvey Bullock is a good guy here, just like in the New 52, and I like him that way. The main story line for most of this book is False Face Society an underground crime family run by Black Mask and Batman is infiltrating it with his "Matches Malone" persona. I don't know if he does this identity anywhere else but I love him as Matches. Some great scenes, one where he and Alfred take a look back at all his past loves and the criminals they turned out to be. This is an all ages comic, perfect for kids but the story is plenty entertaining enough for adults also. I hate these little digests though as they are just too hard to read. Vol. 1 and 2 combined give us up to issue #9, but all 17 issues can still be purchased individually online, which would be my preferred choice to buying the complete series.